All of these programs have seen a steady increase in need, especially with younger (K-6) students. The MVCMS "Access and Inspiration" program, begun in 2016, has expanded those offerings considerably, by improving our lessons inventory and adding an Artist in Residence Program. In Spring of 2017, the MVCMS expanded its support of music education by hosting the first annual Artist in Residence (“AIR”) program, funded initially by a generous grant from MVYouth. 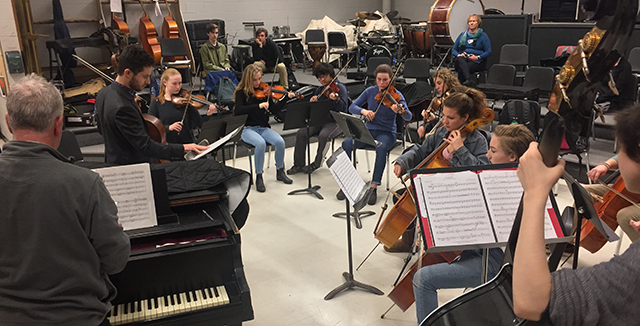 Through this program, dozens of Island student musicians had an opportunity to study with master cellist Andres Vera, and to perform with him on stage. Mr. Vera is a performer, collaborator, and teacher, and plays with the Grammy award-winning Quartet San Francisco. He is also a founding member of Cello Street Quartet in San Francisco. Previously, Mr. Vera performed on-Island in 2016 with the Quartet San Francisco. 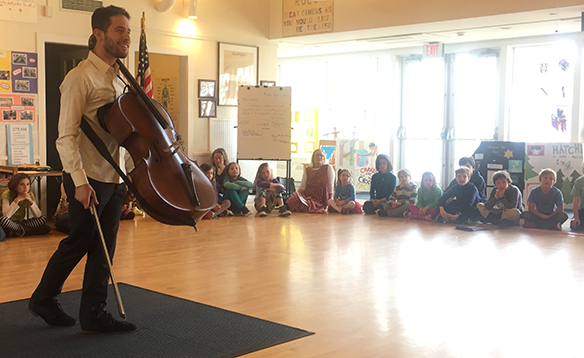 Cellist Andres Vera presents his unique playing style to students at Chilmark Elementary School, as part of the 2017 AIR Program. Photo: Douglas Finn. Through this continuing program of “Access and Inspiration” students have been learning new skills, improving their understanding of their instrument, and benefitting from the talents and advice of world-class, professional musicians. The musicians have conducted the school orchestras, taught private lessons, performed for all school meetings, island wide, and mentored public school and private teachers all to the benefit of the island strings students. The AIR is provided at no charge to students, schools, instructors, or concert patrons. The program has also led to a stronger collaboration between MVCMS, the public schools and the West Tisbury Library. The program is a complete success and the Chamber continues work to build its island presence. Plans are in the works to bring the musicians back for a fall Artist in Residence program in early November 2018. The Artist in Residence Program is made possible through generous grants from MVYouth. the MV Cultural Council, The Martha's Vineyard Permanent Endowment, and The Tower Foundation and The West Tisbury Free Public Library. Despite this strong support from grantors, MVCMS will need financial support from private donors to continue this program. Please consider a targeted donation to sustain the Artist in Residence program into the future.